On September 5, 2014, the Chief Executive Officer of the Russian Investment Agency participated in the Investment Forum “Together for the Future” held in Babaevo, Vologda Region. At the forum, organized by the Department of Economic Development of the Region, the measures of state support rendered to small and medium-sized businesses in the Vologda Region were discussed, and the Regional Centre for Entrepreneurship Support of the Vologda region, its main functions and tasks were presented. 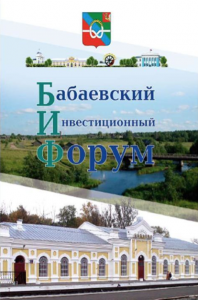 The main objective of the forum was to attract investments in Babaevsky District. The central event of the investment forum was the presentation of investment projects implemented in the Babaevsky municipal area, as well as a demonstration of investment sites. Yury Voicehovsky spoke about the work of the Russian Investment Agency, the economic potential, opportunities of investing in Vologda Region and Babaevsky District directly, as well as made specific recommendations on this issue.